#ShareGoodness (and cheesy puns) | spifftacular. 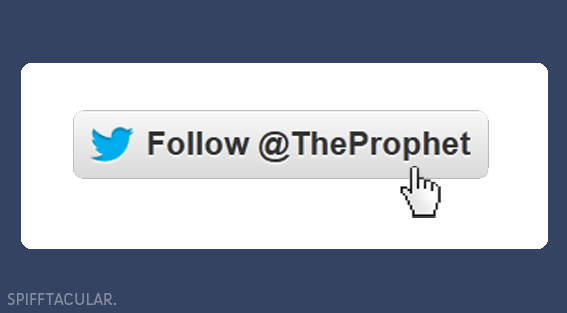 “Follow the prophet!” It’s a chorus you’ll often hear sung by kids in the Church of Jesus Christ of Latter-day Saints. I did make this graphic myself. For the record, the proper prophetic Twitter handle is @MonsonThomasS. Earlier this week I saw a lot of people tweeting about Elder David A. Bednar’s talk “To Sweep the Earth as with a Flood” at BYU’s Education Week. It turned out to be the perfect resource for my talk, and I wanted to share about it here. I hope whether you’re Mormon or not you’ll find it interesting and helpful. The title is drawn from Moses 7:62, where God says that in the last days, “righteousness and truth will I cause to sweep the earth as with a flood.” The tool that Elder Bednar recommended for causing this flood of truth is social media. He invited us all to use social media to share simple messages of goodness and truth. Or, in hashtag form: #ShareGoodness. What simple truths are you grateful for? What did someone do for you today? This should make things easier for us. We’re supposed to share the gospel in natural and not forced ways. So we don’t need to start writing Facebook statuses that sound like a general authority, we just need to say things in our own way that have meaning to us that are uplifting. That’s what will resonate with our friends anyway. Genuine love is essential. For example, I’ve had several experiences where a friend was struggling, and I shared a link to a Mormon general conference talk that related to their experience. Though we have different beliefs, they were able to find something useful from the talk, they appreciated that I thought of them, and we were able to learn from each other and become closer friends. Also, make sure others understand that you are expressing your personal thoughts and feelings, not speaking on behalf of the Church. I highly recommend checking out Elder Bednar’s talk. This blog post is my attempt to #ShareGoodness. How will you #ShareGoodness? 1. Acceleration of technology. Elder Bednar discussed the amazing acceleration of technology–and highlighted several ways these advancements were foreseen by past prophets. I’ve been interested in this acceleration ever since my communications classes at BYU. For example, this graph shows how “innovations introduces more recently are being adopted more quickly.” And there are some fascinating (though largely over-my-head) theories and ideas out there, such as Moore’s Law, the work of Ray Kurzweil (as in his TED talk or this essay), and this examination of acceleration. It’s even more fascinating that this technological acceleration is happening in parallel with a spiritual acceleration, or what Mormon Church leaders have described as the hastening of the work of salvation–namely, spreading the gospel of Jesus Christ throughout the world, strengthening members of the church, and doing family history and temple work. 2. Of selfies and general authorities. As I mentioned in my talk at church today, it was quite amusing to hear matter-of-fact Elder Bednar use the word tweet. I also loved in the last general conference hearing President Uchtdorf say selfie. So if in the next conference we can just get President Packer to say hashtag, that would be awesome. At this point in my talk, yes, I totally attempted an impression of President Packer’s gravelly voice. Dave and I had so much fun researching tech terms that have been used by general authorities that we made a quick video compilation of soundbites including the above-mentioned tweet and selfie, along with President Monson saying blogging and Elder Perry saying the Internet. Alas, I can’t post it without permission from the Church’s Intellectual Property Office–if I get the green light, I promise I will post it, because it is awesome.